Homemade Blueberry Sauce comes together in just a few minutes. Try a spoonful with your morning yogurt or spooned over a stack of fresh, hot pancakes for a delicious treat! It’s not quite spring here in Ohio, but this weekend’s ample sunshine could have definitely fooled you into thinking we were well on our way to blooming tulips and bike rides. However, one step outside, made you quickly realize that the air is still pretty darn cold, but all the sunshine had me craving spring flavors and luckily our fridge was stocked. As I’ve mentioned before, we subscribe to the grocery delivery service, Door to Door Organics, and earlier this week, I accidentally ordered far too many half-pint containers of blueberries. I blame it on drowsily adjusting my order at 2 o’clock in the morning while we were up with our sick little babe. I thought about freezing the blueberries for smoothies or snacking, but realized I already had several frozen bags in the freezer. Since I had no plans of eating blueberries with every meal, I decided to whip up a batch of homemade blueberry sauce for our Sunday morning pancakes. And since I doubled the batch – see I told ya, I ordered way too many – we have plenty leftover. Homemade blueberry sauce comes together on the stovetop in less than ten minutes with just a few staple ingredients: fresh or frozen blueberries, water, sugar, lemon juice and cornstarch. And it’s absolutely delicious spooned over just about anything from pancakes and waffles to ice cream and cheesecake. We also love stirring a spoonful into vanilla, Greek-style yogurt with a sprinkle of granola for fun and tasty afternoon snack. 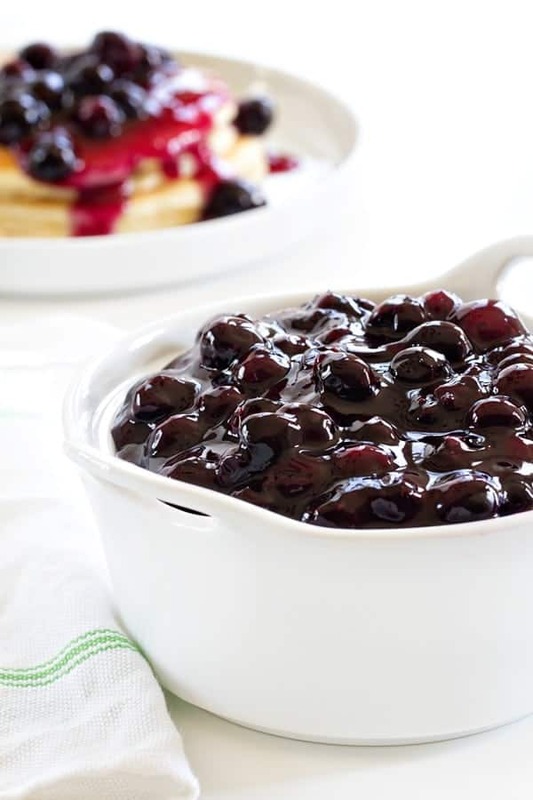 Whether you’re serving this sauce up with breakfast, dessert or a midday snack, it’s sure to please the blueberry lover in your life and get you in the mood for spring! If you’re looking for more breakfast ideas, be sure to check out my Olive Oil Banana Walnut Muffins and these incredible Lemon Raspberry Scones. This Homemade Blueberry Sauce post was updated from the archives. It originally appeared on My Baking Addiction in 2011. In a medium saucepan over medium heat, combine the blueberries, 1/2 cup of water, sugar and lemon juice. Stir frequently, and bring to a low boil. In a small bowl, whisk the cornstarch with 2 tablespoons of cold water. Slowly stir the cornstarch into the blueberries, taking care not to crush the blueberries. Simmer until the homemade blueberry sauce is thick enough to coat the back of a metal spoon, about 5 minutes. Remove from heat and gently stir in vanilla and lemon zest. The amount of sugar that you use will depend on the sweetness of your berries, simply adjust the amount to suite your taste. If this sauce is too thick for you, slowly add in water until you reach the desired consistency. No lemons on hand? This homemade blueberry sauce recipe tastes really great with orange juice and zest. This is wonderful! Made it to go along with cheesecake crescent bites for Thanksgiving morning. I’m so glad you liked it, Jamie! My first attempt with this recipe…I used 1/4 C. sugar. It turned out great. Not overly sweet. Used as a topping on fresh baked lemon bread. Wonderful, Audrey! I love it with anything lemon! I made this for my daughter who can’t have cane sugar. So I used coconut sugar and it turned out great! Thank you for a great recipe. I’m so happy to hear that, Keith! It tastes great with chocolate cake!!!! Great, Sarah! I’m going to give that a try! Not a comment but a question… do you think I could use honey and/or agave nectar instead of sugar? I have a surplus of both and thought it might be good? I’m tripling the recipe though so don’t want to do this unless you know to avoid throwing away alot of blueberries! Thank you!! Hi, Kathleen! I’ve never tried honey or agave nectar in this recipe, but I think you should give it a try. Let me know how it turns out! How long can I keep this sauce. I have way too much to use only once. I assume it needs to be refrigerated after I make it – does it then need to be reheated next time I use it? It is delicious and I want to be able to use it again. Hi, Shirley! I’ve never frozen this, so I honestly don’t know how it would turn out. You can reheat if you like, or I’m sure it would taste good cold. I’m so glad you liked it! I’ve kept this in a mason jar in the fridge for 2-3 weeks. Just put a couple of spoonfuls into my yogurt…yum! Or use on banana oatmeal waffles…heat a few spoonfuls in a little custard cup so it’s warm on the waffle. I make it WITHOUT sugar and half the cornstarch…still delish! Thanks so much for stopping by, Susan! I appreciate you taking the time to comment. Happy Baking! I loved it!!! and it’s so easy! I’m so glad to hear that, Wendy! You’re so welcome, Willow! I’m glad you enjoyed it! I made a Light Japanese Cotton Cheesecake (flavored with lemon juice and zest and needed a sauce to serve with it. I found your recipe for homemade blueberry sauce and knew right away that it would be the perfect sauce with my cheesecake. I was not disappointed. My husband loved it and asked for a second helping. Then, he licked the pan that I used to make the sauce clean. I will definitely be making this again. Thank you for posting this recipe. You’re very welcome, Vanina! Your cheesecake sounds amazing! How long does the sauce last in the refrigerator? Hi, Thelma! I would say about five days or so. I hope you enjoy it! I don’t see why not. I haven’t tried canning it, so I’d love to hear your results. I hope you enjoy it, Nicole! Quick, easy and delicious! My blueberries were very sweet so I used 1/4 cup sugar and it came out great. Thanks for the recipe. You’re welcome, Heath! I’m glad you enjoyed it. Perfect. Recipe and directions were spot on, no way to mess this one up! So happy to hear you liked the recipe, Becky! Thanks for stooping by and leaving your feedback! This recipe was very simple to make and taste wonderful! Thank you for posting this recipe. So happy to hear you enjoyed it, Tara! i believe it taste more blueberry now…. still good sauce, thx. Can blueberry sauce be frozen? Yes, Ruth, it freezes well! Enjoy! I love this recipe! Blueberry pie without the crust. Yum! :) I canned this. I made 4 times the recipe which made 8 250 ml or 1/2 pint jars. Thanks so much for stopping by! Glad it canned well for you! Enjoy! Did you water bath or pressure can this for canning? And would you share the time for processing. I did this in a water bath but I now use cook type ClearJel, which is available on Amazon, instead of cornstarch. Cornstarch is not recommended when canning but ClearJel works beautifully. Use the same amount as the cornstarch. Today I used my date square recipe, replacing the dates with this blueberry sauce. OMG sooooo good. I added a bit more cornstarch and water as I wanted it a bit thicker. Thank you for this recipe. My family loves it. I’m so glad to hear that, Connie! I was thinking about canning this recipe for Christmas gifts for my goody baskets. So my question is to anyone that has canned this how long has it lasted did you do a refrigerated or freezer or shelf I want to able to put it on the jars. I know several people have canned this with good results, Debra. Hopefully you can get some good feedback! Best of luck. 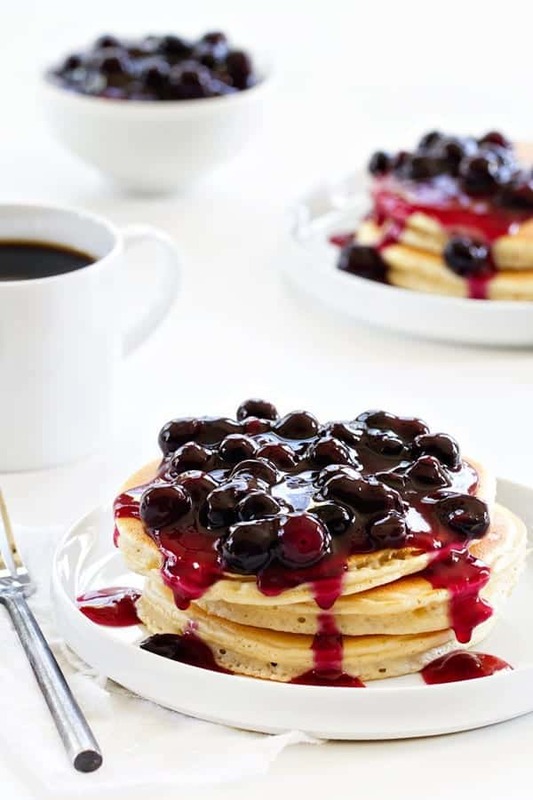 Can you can the blueberry syrup? Hello! I am not much of a canner, but I have heard from others that this recipe is able to be canned. Thanks for stopping by. So happy to hear you enjoyed, Lisa! I forgot to mention that when I made this to can I omitted the cornstarch as it is not recommended that you use it in canning. I simply cooked the sauce longer until it reached the desired thickness. Thanks so much for your feedback, Leslie! Verry easy to do and tastes outstanding!…..would highly recommend. G.
Love this! I made it with raspberries, and use a little less vanilla. No lemon zest. My boyfriend was impressed! Ty, will use again! So happy to hear you enjoyed the recipe, Marcella! I made this to go with cheesecake at Christmas dinner. Didn’t have lemon, so I used orange instead. It was amazing! And super easy to do. This sauce is awesome!!!!! And I haven’t even tried it on anything yet…just a spoon!!! LOL!! I will be hunting down the recipe for those Swedish pancakes!!!!! So good, right? I mean, there is absolutely nothing wrong with eating directly from a spoon! Thanks so much for stopping by! I would think it would be fine for 3-5 days, we usually use it up well before then. Thanks so much for stopping by. How long does it keep and how? Needs refridgeration, I assume. You can refrigerate is in a covered container for about 5 days. I hope this helps. I am so glad to hear you love the recipe, Norma! I have used this recipe several time and absolutely adore it! Every 4th of July I make a batch of blueberry and a batch of strawberry to make red, white and blue short cake. It always turns out amazing! One thing I’ve found with using strawberries is that they break down very quickly so I like to add another cup of sliced strawberries right at the end after adding the vanilla and zest. Since the strawberries break down more, the sauce is a bit thicker but I guess you cannadd more water to thin it out if necessary (I like it the way it is). Thank you so much for sharing this yummy recipe! So happy to hear you enjoyed the sauce, Shannon! Thanks so much for stopping by and leaving your feedback! Thanks so much, Sandra! So happy to hear you enjoyed the recipe. Coming back to this recipe again this year as the wild blueberries are ready to pick along with the pitiful handful from our planted bushes. This is absolutely delicious and I am going to make it in the morning for Sunday pancakes. I love it as is and won’t be changing a thing, thank you for sharing the recipe with us. So happy to hear you enjoy the sauce, Melissa! Thanks so much for stopping by and leaving your feedback! This was fabulous!! I put it on Cheesecake #17 made in the instamt pot. So happy to hear you enjoyed it, Nellie! Thanks so much for stopping by and leaving your feedback! I haven’t personally canned this, but hopefully someone will chime in who has! Thanks so much for stopping by! It turned out great for my home made cheesecake. Thank a lot. So happy to hear you enjoyed the sauce, Juverna! Thanks so much for stopping by and leaving your feedback! I would use half the lemon next time – I can’t taste the blueberries at all. It’ll still be a good sauce but disappointed I lost my blueberries to the lemon flavor. Hi Sarah – So glad you tried the recipe! Definitely feel free to adjust the lemon to your own tastes next time. Thanks for stopping by. Happy baking! Thanks for the lovely and easy recipe. Made it and love it. Will become a staple. Is is absolutely amazing with double cream plain yogurt! Thanks for sharing. So happy to hear you enjoyed the sauce, Esmien! Thanks so much for stopping by and leaving your feedback! I love this recipe – I have used it many times over the past couple of years. It’s easy to make and always turns out perfectly. I’ve even tried it substituting haskap or saskatoons instead of blueberries, and it is delicious every time. Thank you very much! So happy to hear you enjoy the sauce, Sheryl! Thanks so much for stopping by and leaving your feedback! Does this blueberry sauce need to be refrigerated? If so, how do I serve when it is cold? Hello! Yes, you will need to refrigerated any leftover sauce. You can reheat it gently on the stove over low heat to serve later if you like. Hope this helps. Happy baking! Thank you for sharing! I was wondering if you could use liqueur in the blueberry sauce? Hello! I never have, but you should definitely try it! I would just subtract the amount of liqueur you use from the amount of water called for in the recipe so you still have 1/2 cup total of liquid. Hope this helps! Let me know how it turns out. Happy baking.